Chico is a wonderful town. City and university leaders have spent endless time and money to remind us of this, and largely the campaign for us to stay in love with Chico has worked. But, I wonder if the glamorization of Chico has diverted us from broader interests. To a certain extent, we have a “Chico First” focus, or “North State First,” which is nice, but can also be provincial. The reality is, though, that the world is a much larger place than Chico; our student population illustrates this. Only about 29 percent of Chico State’s students come from its “service area” of northeastern California and fewer will spend their careers in this part of the state where jobs for college grads are clustered in agriculture, beer production, Enloe Medical Center and social services. For the 71 percent from elsewhere, and even the 29 percent from around here, there is a statewide, national and international world of experiences, and jobs waiting for them too. (1) The disappearance of Study Abroad sites sponsored by Chico State in Beijing, London, and Merida, Mexico. (2) The declining numbers of incoming international students, especially in the last three or four years. In fall 2014, there were more than 700 international students at Chico State, and in spring 2017 it was down to 431, a drop of over 20 percent. (3) The declining numbers of foreign language offerings at Chico State. The drop in Chinese offerings mystifies me the most because, along with English and Spanish, it is one of three world languages. On the brighter side, I understand that the Asian Studies and Latin American Studies majors are doing well, even if no faculty are hired specifically for these programs. But still, the overall trajectory is down at Chico State, as it is in many American universities. American universities had a 10.2 percent drop in international enrollments in 2016-17. 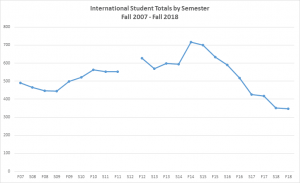 At Chico State, this happened at least in part because rising tuition payments for international students were not plowed back into programming, and tuition was higher than international students were willing to pay. Nationally, future enrollment is expected to drop even more quickly in the context of new visa restrictions on students implemented by the Trump administration, a situation which is likely to be felt at Chico State. Why are American universities succumbing to the national trend by retreating from the world stage when universities like Chico State have historically been the passport to the world for so many? My short answer is that despite the rhetoric, internationalization is in fact a fairly low priority at Chico State and around the country. What are higher priorities? Watch Chico State’s website, or for that matter those of similar universities. At Chico State, featured are things like graduation initiatives, agriculture, technology purchases, entertainment, distance education programs, STEM, sports. Administrative priorities like Risk Management, North State Initiatives, Assessment initiatives, and so forth round out concerns. All good stuff, but focusing on other initiatives means that international and global issues get pushed to the back burner. Thus, no longer are the words “Globalization” or “International” prominent in Chico State’s everyday presentation of self, despite the fact the G word in particular is prominent in Chico State’s mission statement. Indeed the last two words of Chico State’s mission statement are “global society.” The last words are not north state, accountability, nor assessment. “Global society” are the last words in the statement but have turned out to be left behind in the day-to day-work of the university. Chart shows plummeting number of international students at CSUC during the past several years. No data was available for fall and spring semesters 2012. Graph courtesy of CSUC’s Dean Fairbanks. Irrespective of explicit policies, though, Chico State is indeed internationalizing because ultimately, California’s population is internationalizing. I especially saw this in my sociology classes last semester, where about half of the students spoke a heritage language, mainly (but not exclusively) Spanish. Far fewer faculty can claim this skill, and even fewer administrators. My students also have an abiding interest in all things Latin America (and Asia) among them. My own experiences abroad in Germany and Thailand tell me, too, that Chico State faculty and students have a strong interest in internationalization — they spend their own money to come visit! But this does not get translated into what we do in Chico as “internationalization,” where instead we are focused on “North State First” and its celebration of a beer factory, almonds, and Bidwell Park. And finally there is the problem that internationalization is viewed through the lens of financial profit at Chico — will it pay for itself, or better yet subsidize other programs? The answer is actually “no,” internationalization does not pay for itself any more than do English, U.S. government, or biology classes. Internationalization is a goal for its own sake, just like teaching General Education. Chico State needs to bring international students and faculty here and send our students abroad because this is the 21st century. And then there is the biggest upside to leaning back toward internationalization policies. What is more educationally engaging: Regional assessment meetings catered by Sierra Nevada Brewery, or beer and marzipan (made with Chico almonds!) in Germany? 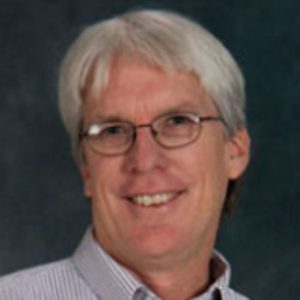 Tony Waters is a professor in the Department of Sociology at Chico State and in the Department of Peace Studies at Payap University in Thailand.